Why is the camp fire cooking grill so good? We offer two different options for campfire cooking – the "family" sized Pioneer grill » and, a bigger grill, the NEW Original » the biggest grill in the range for the larger group or appetite. 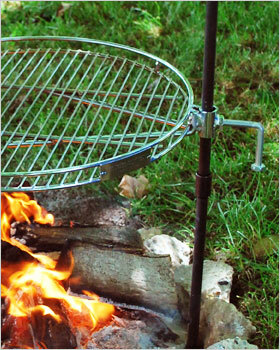 The grills are straightforward to assemble allowing you to cook over open campfires or firepit. The easily adjustable design means you can vary the cooking height to suit the fire you are cooking over and the food being cooked. Cooking is also made easier with the rotating cooking grill – this allows you to turn the pot or grill away from the fire when you want to turn or serve the food without risking burning yourself. In addition, the raised grill edge found on all models will prevent your food rolling into the fire or onto the ground when you are moving it around on the grill or turning it on the grill. Any meat or fish cooked on a grill will not sit in its own fat or oil during cooking as the grease will just drip into the fire, making this a very healthy and delicious way to cook your food. All the waste from cooking goes straight onto the fire so the grill has very little residue on it after cooking. Once you have finished the grill can be turned away from the fire and allowed to cool. It is then a simple task to wash the grill and upright stake, before packing them away in the free carrying bag, making it easy to pack and store.